A Kansas State University study shows feeding cattle higher concentrations of zinc helps improve growth and could improve profits. Kansas State University researchers have found that feeding concentrations of zinc that are higher than recommended dietary concentrations can help improve the growth of finishing cattle, a finding that could lead to more profits for the industry. Cadra Van Bibber-Krueger, a doctoral student in the university's animal sciences and industry department, reported results of a trial that fed zinc at concentrations ranging from 0 to 90 parts per million of the finishing diet. The National Research Council's current recommendation for nutrient requirements of beef cattle is 30 ppm dietary zinc. "We found that supplementing up to 60 ppm zinc—for about 90 ppm total dietary zinc—optimized feed efficiency in finishing cattle," Van Bibber-Krueger said. "The study suggests that finishing cattle have requirements for zinc that are substantially higher than the currently recommended concentrations." 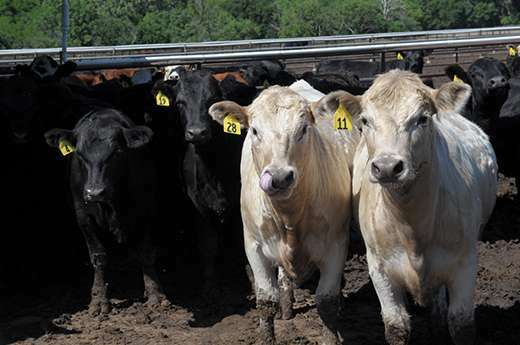 When selling cattle on a grid – a marketing system that takes into account such factors as carcass weight, yield and quality grade and other factors—Kansas State University's work predicted that supplementing 60 ppm in dietary zinc could result in an increase of $25 in total carcass value for a trace mineral that costs less than a penny per day, said Van Bibber-Krueger. "The potential to increase the value of carcasses by supplementing the proper concentration of zinc can have a big impact on the industry," she said. Kansas State University's trial tested just zinc, a mineral that is essential for normal function of more than 300 enzymes in microorganisms, plants and animals. Zinc and other minerals foster metabolism of nucleic acids, proteins and carbohydrates, all of which are essential for growth in cattle. Improving feeding efficiency means that cattle grow more efficiently with less feed. No differences were found found in marbling score, rib eye area or back fat. Van Bibber-Krueger said that increasing supplemental zinc to 90 ppm decreased performance, indicating excess zinc can be detrimental. "This is just one mineral," Van Bibber-Krueger said. "If we can figure out what the actual concentrations that finishing cattle need for all of the minerals, think about the kind of impact we can have in the future." The full study, "Supplemental Zinc Sulfate Affects Growth Performance of Finishing Heifers,"was published in the proceedings of the 2016 Kansas State University Cattleman's Day.